It just takes one overnight frost to kill my beloved herbs in the garden, but I was smart this year. Instead of waiting for the quick death of my basil plant, I froze it before Mother Nature could get to it. 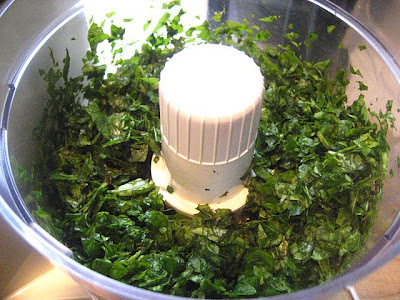 I harvested all the leaves and pulsed them in a food processor. I added just a little olive oil to bind. Put a tablespoon of this basil compound into plastic ice cube tray compartments. Freeze until hardened, then you can store them in a ziploc freezer bag. Now I can have a taste of summer for my winter stews and sauces whenever I want! Hurry up and do it! Being that I live in NJ also, I have this problem every year. Thanks for the great idea .. have you done it with parsley also? My rosemary , oregano, and sage survive the winters, yours? great tip. I've got pesto in the freezer but need to do this with my remaining basil. I didn't get enough basil this year to save :( I wanted to dry my thyme, sage & oregano but it won't stop raining. I also didn't get enough basil to save. 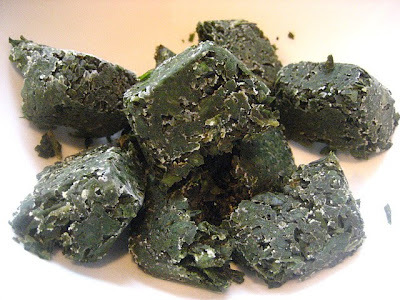 I have seen frozen herbs at The Fresh Market and have used them with great success though. The frozen herbs are much better than dried. Great way to save your basil. You sure will enjoy it later on. Stacey, what a great idea. I've got four pots of basil and I better get with it before our first frost comes to the mountains. I did this last year and it was great! I need to hurry up and catch this year's harvest before it's too late. When my basil dies, I grieve the end of summer. I made pesto with mine. Silly me, I should have frozen plain basil. D'oh! You're so smart! I'm in mourning over my fresh basil that I will no longer be able to have. I still have some left and I will do this. What can I do with sage, I have a big bush? I swear, I am going to get better at managing my herbs next year. It's like my lack of a green thumb extends to failing to get the most out of my fresh herb supply. Oh, this is just what I needed -- I want to freeze up some basil for winter but wasn't sure how or whether to use water or oil to bind. Does it come easily out of the ice cube tray? What an amazing idea. I have seen this trick around, but completely forget to use it!